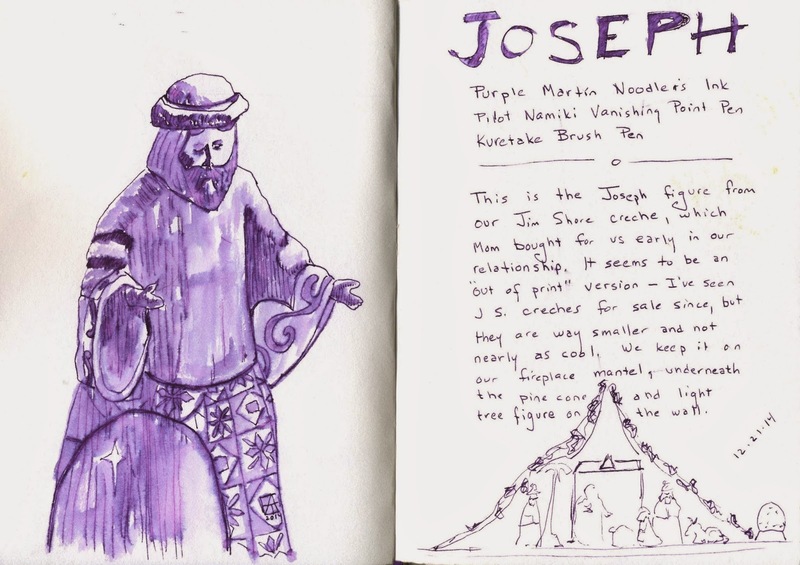 Keeping a notebook, or a sketchbook, is the "one best habit" which highly talented people have in common, according to this article by Daniel Coyle at The Talent Code. If my year in art is any indication, that's true! 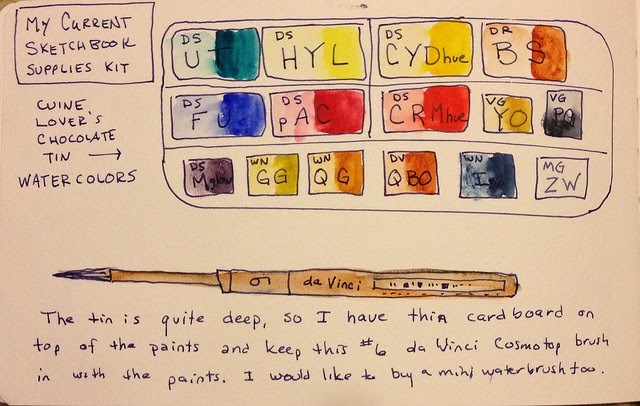 Not that I'm any great artist like the notebook keepers Coyle mentions in his article (DaVinci, Franklin, Twain to name a few). But the daily practice of making art and experimenting with ideas and techniques really paid off in the development of my abilities. If you've been wondering if you could ever keep a notebook or a sketchbook to capture and develop your ideas and inspirations--you can! Check out the notebooks for sale at jetpens.com! If you want to have a look at lots of luscious notebooks, check out Jet Pens! I am not affiliated with them, at all. Just an enthusiastic customer. Or just grab some paper you like, staple it together, glue some thicker paper on the outside for protection, and go. 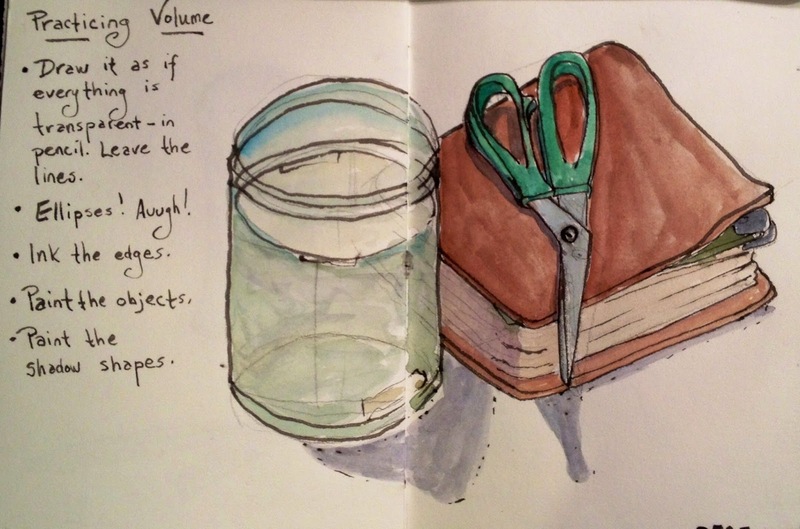 A sketchbook doesn't have to be fancy or expensive. You just have to want to carry it (and something to write with) with you all the time. Why not make a New Year's resolution to keep a notebook and/or sketchbook with you every day for the next year and jot things in it as often as you can? Then this time next year you can look back through the things you've captured and see how far your thinking, skills, and talents, have come. Need more inspiration? 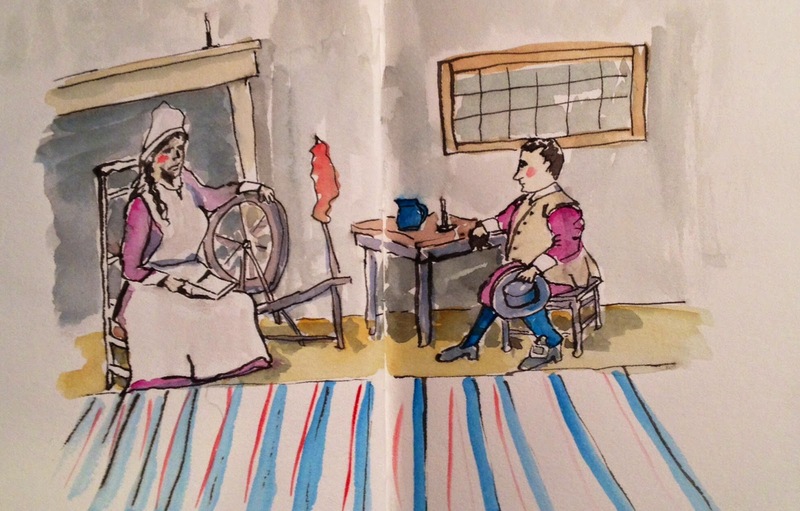 Consider this: Near the end of his life, Ben Franklin credited his notebook-keeping habit for "the happiness of my whole life." That's some endorsement for keeping a book of scribbles and scratches! I have four pages left to finish the sketchbook I'm currently working in. I think I'll try to fill them all today. Then I can start the brand new year with a brand new sketchbook? Which sketchbook will I use next? I believe that Brené Brown is one of today's greatest writers and thinkers and speakers on creativity, the spirit, art, and living a quality meaning-filled life. I have read her books. Watched her videos. Taken two online classes with her. Her explosion into the cultural consciousness started with this talk for TEDx Houston, delivered in June 2010. I rewatch it every so often because really, it is incredible. Vulnerability as a strength. As a path to courage. As the key to authenticity. So many of us need to remember these things as we draw and write and scribble our explorations into our own lives and that which is meaningful to us. I hope you enjoy it. You can learn more about her work here. Looking for something creative to do with the kids home from school this holiday season? Seeking a little private quiet time for yourself? Feeling like just stopping--even for a just a few minutes--will help you regain the Christmas spirit and maybe a healthier perspective on the late-December madness going on all around us? Give this idea a try: sketch or draw or paint your holiday decorations! You'll be surprised at how complex and beautiful each piece is all by itself. Last night I sat down at a table with family members, each doing their own thing. 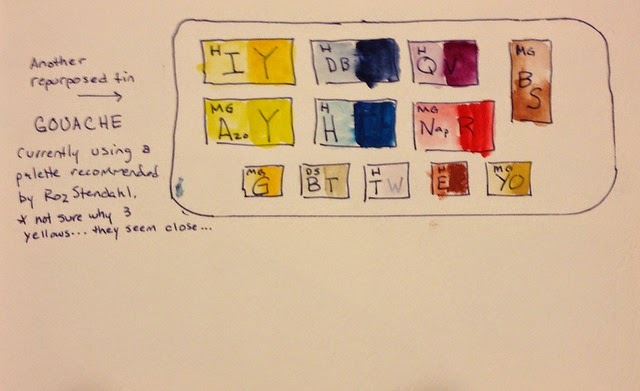 I sketched two pieces from a Jim Shore creche which I've had for years. I love those figurines and I look at them a lot. Still, not until I drew them did I see the intricacy of the designs, or really study the shapes and postures. 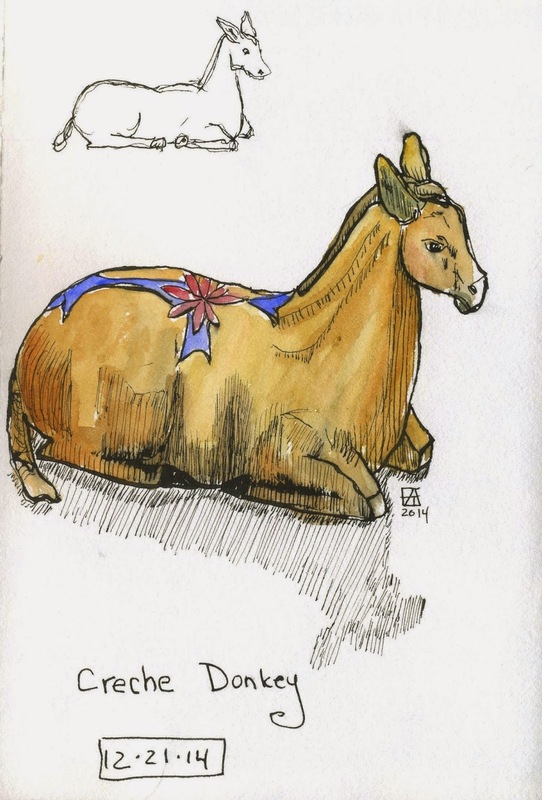 I drew the donkey directly in ink, then added the watercolor. You can see that my Noodler's Bulletproof black ink (which I so very much want to love) ran a bit, even though I had given it a good fifteen minutes to dry. The small drawing at the top I did second, because I felt that the proportions on the first big drawing weren't terrific and I wanted to give it another go, just to see if I could get it a little closer to what I observed. I loved the banner draped across the donkey's back. If you had asked me to describe this donkey before I painted it I would have told you he was brown and lying down. But I wouldn't have described a blue banner with a red flower. You can see why I have to draw stuff. I'm not very observant otherwise! I drew this one directly in ink, using Noodler's Purple Martin ink in a very fine point Namiki Vanishing Point fountain pen. This ink is water soluble, so I used it with the intent of going back in with a water brush for color and shading. 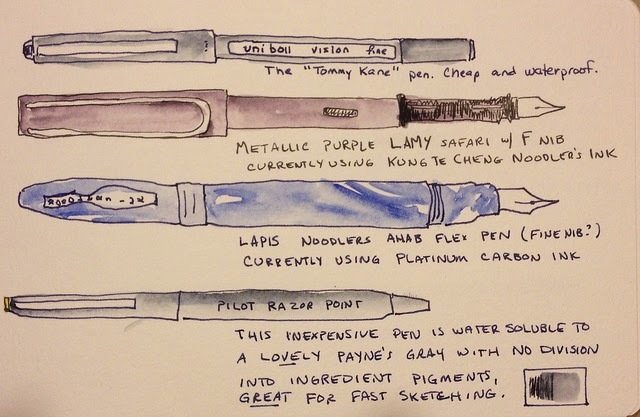 You can see that when it is wet, the ink breaks into some component blues and pinks. I can't really control that, but I thought the result was pretty cool. Drawing the ornaments helped me appreciate them at least twice as much as usual. I love them as part of my holiday decorations. As I mentioned earlier, I look at my creche a lot. But focusing on just one piece at a time and drawing it gave me so much more beauty. I could appreciate Jim Shore's artistry in creating the work--the colors and shapes and themes across the pieces in the set. 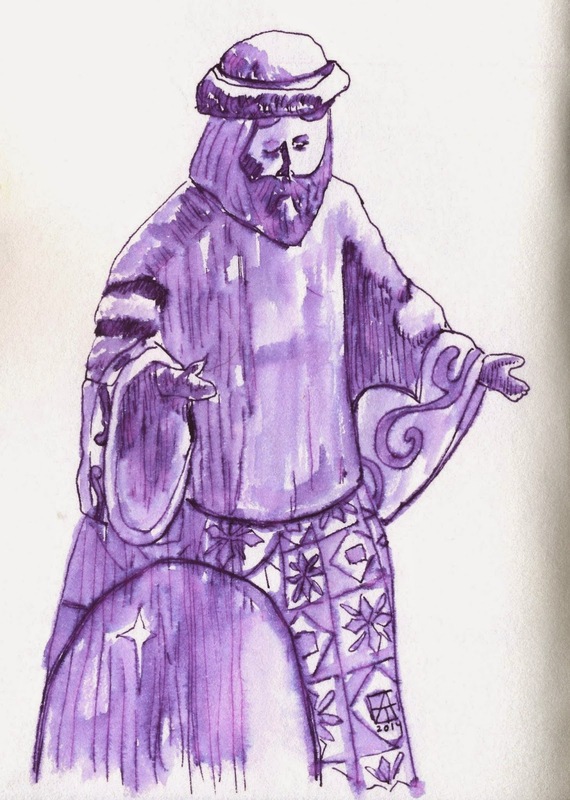 I meditated while in the flow of the challenge of drawing the figures. I let my mind wander over and around who these figures represent and their role in the Christmas story. How? I described how we display it with other decorations each year. Writing about the figure in the context of those questions reminded me of the history of the figures in my family, the love we feel for each other, and made me remember all kinds of nice stuff from the past! You can draw ornaments from your tree. Decorations outside of your house. Presents wrapped and waiting. You can even draw food! I have a friend whose cooking is her art. 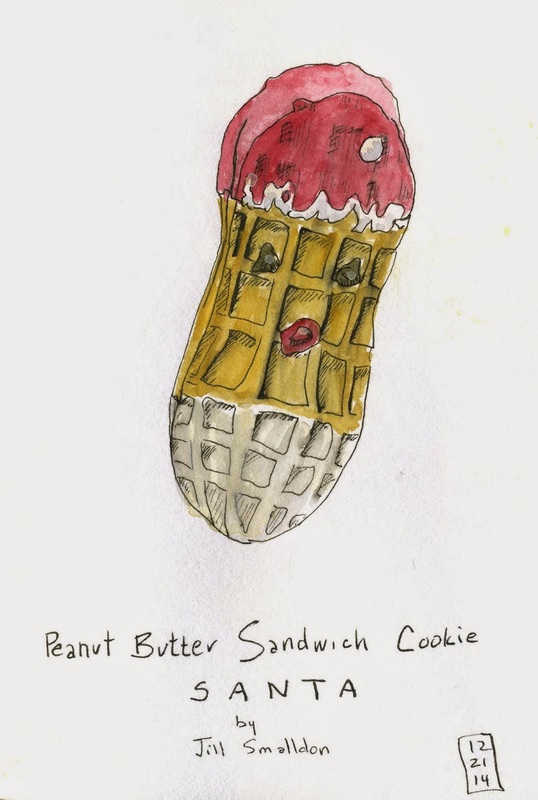 I drew one of her cookies. Best wishes for a holiday full of peace and spirit and art and fun! Such simplicity. A glass of water. How can something so simple be so very hard to draw? I think there's a lot to be said for the complexity of the simple. Water. My mind starts spinning a little: water, so easy from my faucet. People who walk miles to find water. Unclean water in so many places. Innovators making self-sustaining wells for clean water. Diseases carried by water. Universal solvency. Most of our bodies--water. Most of our planet--water. It is so hard to draw! Drew this as an exercise for Liz Steel's Sketching Now Foundations course, which I am loving and finding a good solid challenge. Our task: to sketch multiple objects as if they are transparent, sketching the entire volume of an object in pencil, over and over until we get the lines, the angles, the edges right. Then ink the edges as the if the objects are again solid, leaving the pencil lines to help us learn from our mistakes. Then add color. Then add shadow shapes. Great exercise. I'm not sure everyone appreciates a handmade gift. 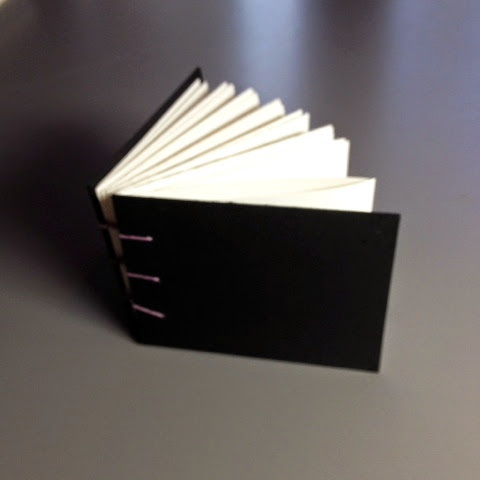 But sketchers, writers, keepers of sketchbooks and art journals and most kids love a handmade blank book. Even simple designs bring delight to these creative folks. Maybe it's because by giving a blank book as a gift you cast your vote of confidence that your loved one can and will fill it with something meaningful. 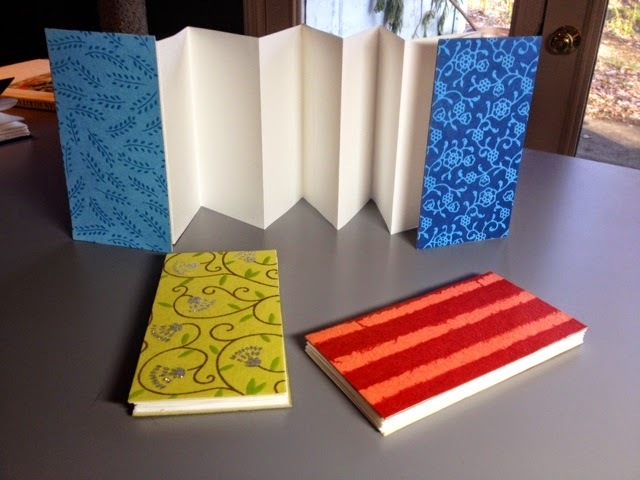 I made these three matching accordion books today as gifts for the three daughters of some friends. 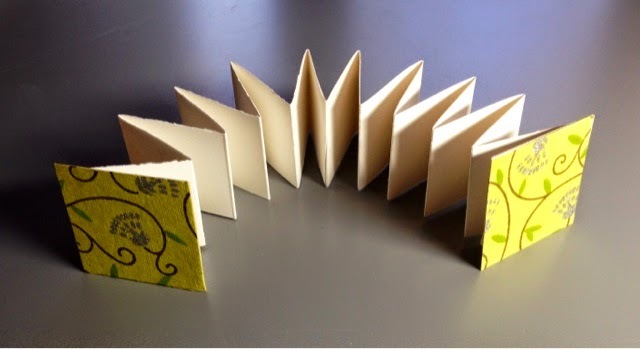 Used 11 x 17 mixed media paper, cut in half horizontally, and glued together to make a nice long accordion. Then I used mat board scraps I buy very inexpensively at a local frame shop for cover board. Covered that with fun handmade paper scraps. These three cute little gifts were together in only a few minutes. That got me looking at other nice paper scraps I could use to make cute gift books. This tiny, two inch square accordion contains the trim of some Arches watercolor sheets I used to make a big sketchbook earlier in the year. I have a friend who loves to paint "tiny" and I think she'll enjoy this for Christmas. Then I snagged some wider but shorter scraps from other bookmaking projects and trimmed them to make a 3 x 4 inch book which I sewed with Coptic binding. Not sure to whom I will give this little book yet. It was a fun set of projects and I put a lot of my saved scraps to good use! Cut down on some art room clutter and gained few Christmas presents too. A good day!